Superstar winemaker, Christopher Carpenter, crafts some stunning red wines at Cardinale. Year after year, I have found that Cardinale Red Wine is one of the outstanding Napa red blends available in the retail market. The wine usually displays a wonderful combination of bold fruits and elegance. For those who love a wine that merges old and new world, this is a special occasion wine for you. The creator of this outstanding wine, Christopher Carpenter, is an MBA graduate who has previously worked for Domaine Carneros, Domaine Chandon California, as well as Tenute Antinori, Santa Cristina Estate, in Montefiridolfi, Italy, before coming to Cardinale. 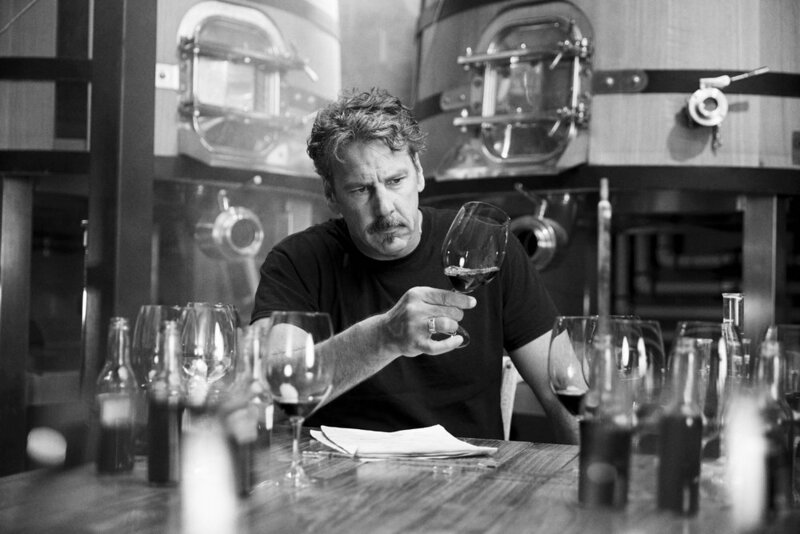 Chris is one of the great California winemakers. Despite his obvious talents, he is very humble when talking about his wines. Meeting up with him in New York, I recently had the chance to sit down with him and chat wine. He talked about his background as well as his recent wines that all showed beautifully from hot vintages in Napa. I think you will enjoy hearing more about him. Here is my interview with Christopher Carpenter, head winemaker of Cardinale. WWB: Who were the first people in wine who inspired you? CC: My server and bartender buddies in Chicago when we were all working in the restaurant business learning about wine. One of them worked at an Italian restaurant that had a decent list that he would share with us when we went in there to dine. Without those days of late nights, hard living and culinary exploration I wouldn’t be where I am today. WWB: Why did you decide to enroll in the viticulture and enology program at UC Davis? Talk about your experience there. CC: I was approaching 30, working during the day in the medical industry and at night as a bartender. My day job was going well to the degree that I had opportunities to move into a corporate position, which after some reflection I did not want to pursue. I was looking for something that could tie my degree in Biology, my love of restaurant energy and a need to do something creative. Through a number of serendipitous events winemaking became that answer for me that could cover all of those things. As a 30 year old I felt I needed to jump start that pursuit rather than start from scratch as a cellar worker, so I applied to UC Davis. With a foundation of education from one of the premiere Viticulture and Enology programs I felt I could have doors open to me that would move me forward rapidly. It was an incredible experience at Davis. Surrounded by students and professors that were deeply engaged in all aspects of the field at an incredibly high level was inspiring, stimulating and energizing. I actually did my masters work in Viticulture and pursued the Enology portion as an aside spending an extra 6 months at Davis so I could accomplish both. I can’t tell you how having the background initially on the plant side has served me in my winemaking approach time and time again. WWB: Talk about how Cardinale has evolved since coming to the winery in 1998 and since taking over as head winemaker in 2001. CC: What has evolved the most from the vintages from 2002 on is a focus on Napa Valley as those wines before included Sonoma fruit. Cardinale blends upwards of 7 different Napa sub-appellations in its blend. In different years different parts of the valley do better viticulturally than others and thus show better as wines, as a result Cardinale becomes a snapshot each year of how the vintage plays out across the Napa Valley. In some vintages it might be Veeder [Mt. Veeder] that drives the wine, in some it might be Spring [Spring Valley], etc. That is what our collectors are looking for, that exploration of Napa and it’s per vintage signature. WWB: Your 2013 Cardinale is a head-turning massive beast of a wine that appears to need some time in the bottle to be fully expressive. Can you talk about this fantastic wine and how it compares to the equally gorgeous 2012 Cardinale? CC: Two incredible vintages. 13 was the flashier of the two, with great structure, driven fruit and definitive high and low notes, reflective of that vintage in general. The 12 has all of the fruit but is more subtle in some of the interactions of the various wines that were blended together. Tannins are silkier, and the minerality shines through big time. Its like comparing a Ferrari to an Aston Martin. Each stands at the highest level of the automobile world one is flashier and faster the other is more subtle and stylish. WWB: Talk about some of your favorite wines of the world and what is in your cellar. Any recent trips to regions of the world or new wine experiences? CC: We have been exploring Rieslings lately in my house. Australian, German, Alsatian, Austrian, and what’s great is each region has its own signature driven by a combination of the place and style. My partner in crime here at Cardinale, Laura Diaz, makes one from Spring Mt for her label Galerie that is incredible. Part of the process before we began making that wine was tasting though at least 100 wines to decide how she would pursue the style. It’s a great variety that I wish more Americans embraced as there are a lot of places we could be growing it here that would rival those other regions. If I am out and not drinking Cabernet I typically will go right to the Brunello listing on the menu. I am also becoming enamored of the wines of Mt Etna in Sicily. Incredible mountain structure with very different varieties. In fact that will be my next wine focused trip. We are partnering with a cruise excursion for our collectors and for those interested in getting to know my wines where we will visit Sicily and Croatia as part of the journey. Pretty cool trip where we will go deep into my wine making on the boat and learn about two of the more exciting emerging wine regions of the world.